The color and style of roofing material you select can add to the beauty of your home. Though it's rarely the center of attention when its doing its job correctly, the roof on your home (or more accurately, the roofing system) is a critical part of keeping you and your family warm or cool, dry, and safe. The visible roofing can be made of asphalt, tar, rubber, clay, composite material, wood, metal, cement, or stone. All these roofing materials are chosen for their ability to keep water out, but each type has benefits and idiosyncrasies and costs that run from moderate to exorbitant. Where you live may factor heavily in your roofing needs. The amount of exposure to heat, high winds, extreme snow, hail, and fire in your area will determine some of your roofing options and maintenance schedules. Regional preferences in roofing may make it easier or more difficult to find certain types of roofing and the laborers who are skilled in installing it. The cost of installation depends upon the condition of the roof deck (if rotted boards or eaves need to be replaced, for example, the cost will go up) and the number of peaks, valleys, and dormers the roof contains. Regardless of the material, all roofs need regular inspections and maintenance. Keeping the roof intact and in good condition is an important part of home maintenance, and typically it's quite easy provided you stay on top of necessary repairs and maintenance. Three or four times per year, a visual inspection of the roof should be made. 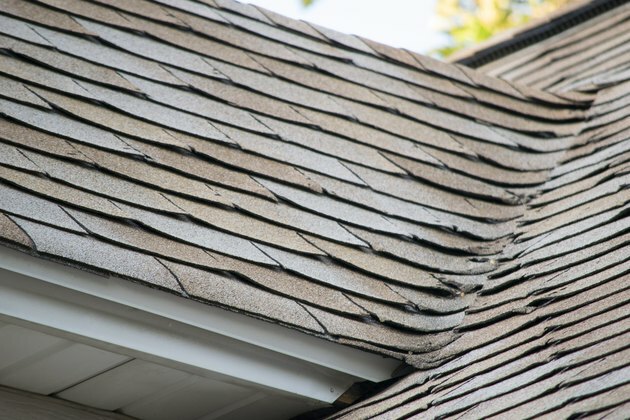 Look for damaged materials—cracked or curled shingles, broken tiles, dents, or holes. Any leaves or other tree debris should be removed immediately. Debris on the roof can impede water flow, which might lead to water damage. And accumulating debris can rot and even form soil in which tree seedlings can sprout. Even small tree seedlings can cause extensive damage to a roof. As asphalt shingles age they become brittle and curl up. This makes them more susceptible to wind damage. Decking or sheathing: the flat sheets of plywood or lumber that the roof is attached to. Dormer: a smaller roofed structure, usually with a window, that projects out of the roof line. Eaves: the overhang of the roof. Flashing: formed metal strips installed in valleys and anywhere the roof abuts with house walls or chimneys. Flat roof: typically any roof with a pitch of less than 2 in 12. Pitch: the slope of the roof. This is stated in terms of inches of rise per inches of horizontal run. So 2 in 12 is a low sloped roof that rises 2 inches for every 12 inches in run. Ridge or peak: the pointed top of the roof. Soffits or soffit panels: material enclosing the underside of the eaves. Typically present in newer homes and absent in many older homes. Square: a unit of measure used to quantify roofing dimension. A square is 100 square feet. A bid for roof replacement will be by the square. Tear-off: the removal of old roofing material, especially asphalt shingles. Underlayment: roofing felt paper or other materials that add an additional layer of protection under the roofing material. Valley: the V shape where two planes of a roof intersect. Asphalt shingles are made of asphalt, fiberglass, felt, and mineral granules pressed together. They are typically made in a rectangular shape with three tabs. Asphalt shingles can be applied to any roof that has a slope of a minimum 4 in 12. They can last from 10 to 30 years, come in many styles and colors, and require only minimum maintenance. Asphalt shingles can be walked on without causing much damage. Installation of asphalt shingles is fairly easy and thus inexpensive. In a properly installed asphalt shingle roof system, the surface shingles are laid over wood decking made from closely spaced planking or sheets of plywood or OSB (oriented strand board). A layer of underlayment, such as felt paper or frost-proof membrane covers the roof deck before the shingles are laid, offering an extra layer of protection should moisture penetrate the shingle layer. Laminated asphalt shingles are simply a thicker, two-layered version of the standard asphalt shingle. The advantage is that the laminated shingle gives more dimension to the appearance of the roof. They are therefore referred to as dimensional or architectural shingles. Because they consist of two layers, laminated shingles are more expensive, slightly heavier, are more wind resistant and have longer warranties. Laminated asphalt shingles are installed in the same manner as asphalt shingles. Roll roofing is made of the same asphalt with a granular coating found in traditional shingles, but is sold in rolls. The rolls are applied in overlapping layers, just like shingles. Roll roofing is typically used on low-sloped roofs, or garage or outbuilding roofs . It does not last very long and is not considered visually appealing. Asphalt roll roofing is installed over wood decking on top of an underlayment called a base sheet. The roll roofing may be applied cold, or it may be applied using a torch to heat the tar component so that it sticks to the underlayment. Rubber membrane is made of ethylene propylene diene terpolymer (EDPM), a petroleum product. This roofing comes in rolls or sheets of various widths. The membrane is usually glued directly to a wood roof deck and the seams are waterproofed. This is a great option for flat or low-pitched roofs. 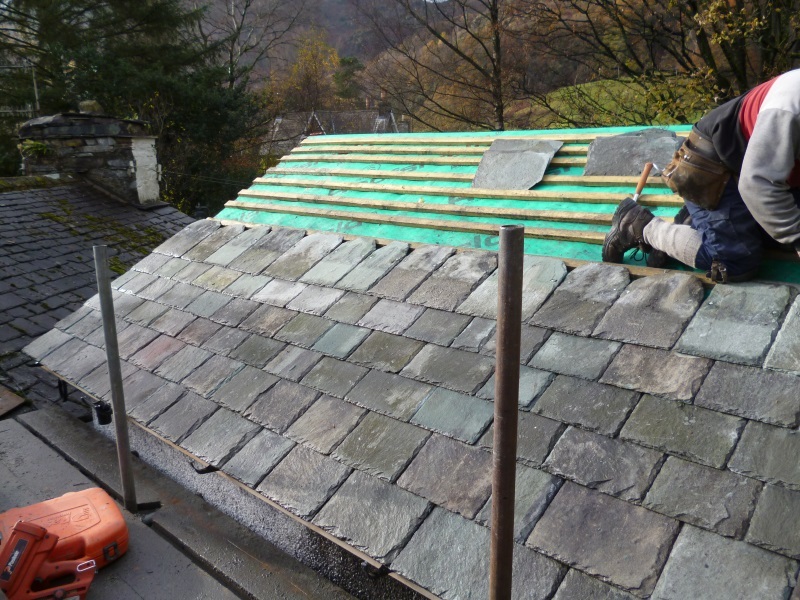 Slate is costly to install because of the preparation needed and the highly skilled nature of the work. Slate is a natural stone that happens to split into flat sheets on its own, so in areas where slate commonly occurs, it has been a choice for roofing for hundreds of years. A slate roof will last up to 100 years, and it is visually appealing due to the natural variations in color and thickness of the individual shingles. Slate is very heavy, and can only be installed on a structure that is engineered to support the extra weight. It requires special skill and more time to install, so is a much more expensive roof from the labor standpoint. The cost of the slate shingles is usually about three times the cost of the most expensive asphalt shingles. Slate is fragile in some ways—you cannot walk on a slate roof—so replacing an individual shingle that is broken is difficult. In Europe, slate roofs are typically installed without roof decking. An underlayment is installed directly over the roof joists. Battens—small horizontal boards—are attached to the joists over the underlayment. The slate tiles are then attached in one of three ways: nailed into the battens through holes in the slate tiles; attached with hooks that do not penetrate the tiles; or attached with a system of both hooks and nails. In the United States, slate roofing is often installed over wood decking and underlayment without a batten system. credit: Redland Clay Tile, Inc.
Clay tile is a very common roofing material in warmer climates. Though expensive, clay tiles are environmentally friendly and fire resistant. Clay tile and concrete tile are very similar and are also quite heavy—coming in slightly heavier than slate. These tiles come in many colors, shapes, and sizes, including flat shapes to mimic slate and wood. The traditional rounded tiles are either a one-part system, in which each tile has a rounded portion and water-collecting pan portion situated side by side; or a two-part system with a rounded top tile and a separate, flatter pan tile installed as separate pieces. Clay and concrete tiles are fragile and cannot be walked on, and tey need to be installed by experienced professionals. Because they are so heavy, wind damage to clay roofing is rare, and they are fire resistant. Installation methods for clay and concrete tile vary depending on local codes and style of tile. Flat clay or concrete tiles are installed the same way as slate tiles, with or without a batten system. The rounded tiles may be installed using mortar, spray adhesive, nails or screws, or wire. In Europe, the tiles may be installed over a joist and batten system similar to the way slate is installed, but in the United States, the tiles are installed over roof decking with underlayment. In some areas, tiles are installed on low-slope roofs. In this case, the underlayment is actually an approved low-slope roof, and the tiles are considered decoration. On steep slope roofs, battens may be required. 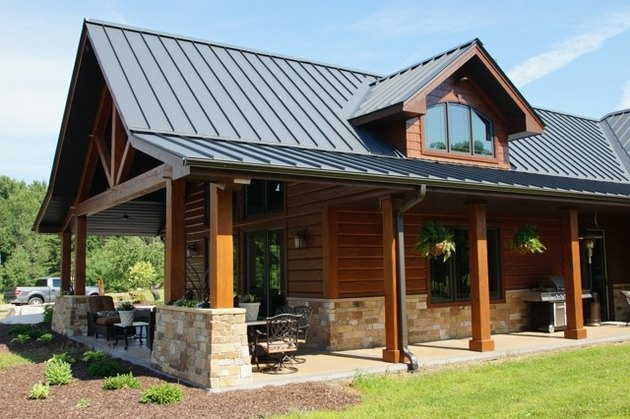 A standing seam metal roof has the advantage of looking rustic or sleek and modern, depending on the building style. Today's residential metal roofing is not the corrugated metal roofing commonly seen on sheds or barns. Most modern metal roofing for homes is called standing seam roofing, and is notable for its durabilty and fire resistance. Standing seam metal roofing comes in preformed long strips or strips that are created on-site with special forming machines. The term standing seam refers to how the strips are joined. An overlapping raised (standing) seam prevents water infiltration. Installation requires workers skilled in both roofing and metalworking. Metal roofing is best suited to simple roof-lines without many valleys. Metal may dent easily, but in hot climates, it is a cooler choice than other forms of roofing. Copper roofing is very expensive, but is fairly common in residential use for limited applications, such as over a bay window or entryway. Copper roofing is typically formed on-site, as most applications are one-of-a-kind. Metal roofing is normally installed over wood decking and underlayment. Most codes allow metal roofing to be installed over a single layer of existing shingles. While it is cheaper forego a complete tear-off of the old roof, this also means that the condition of the sheathing cannot be examined before the new roof is installed. More recently, some metal roofing is available in shingle form, attached to decking with a system of hidden fasteners that limit the number of puncture holes in the underlying decking. Because these roofs so closely resemble traditional asphalt shingle roofs, they are growing in popularity. They are typically much more durable than traditional shingles, though also more expensive. An environmentally friendly option, composite and rubber roofing are made from recycled materials, often discarded tires. This style of roofing is fabricated to resemble other styles, such as slate and asphalt shingles. 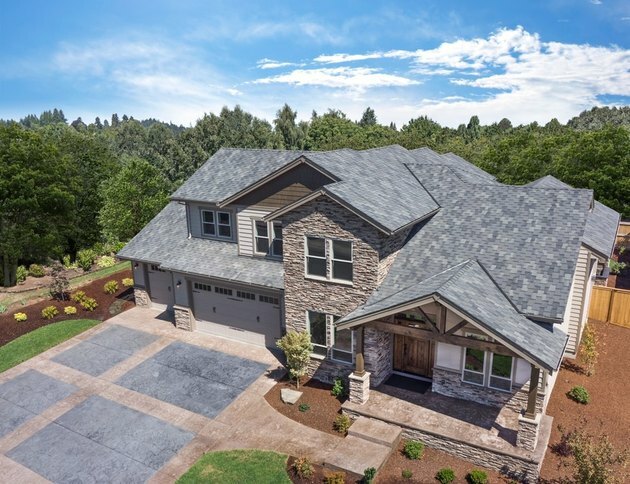 Although the material costs for this roofing are considerably higher than for traditional asphalt shingles, it is often a cost-effective choice. The lifespan for this roof is typically more than 50 years, and installation costs are relatively modest, since the procedures are similar to those for ordinary asphalt shingles. The terms green roof and living roof refer a roof covered with living plantings. This type of roof has the advantage of cooling the air, providing extra insulation, reducing greenhouse gasses, and potentially providing food and forage for humans and wildlife. This roof requires extra structural support because the extra growth medium is quite heavy. The underlying decking must also be covered in a waterproof membrane. Growing roofs are best suited to flat or low-sloped roofs. A new cedar shake roof ranges in color from bright coppery yellow to rich golden brown. In time it will age and weather to a light gray. Cedar wood is naturally weather and rot resistant and conveniently splits into relatively flat sheets. These properties made it a very popular roofing material in the northwestern United States where cedar trees were once abundant. 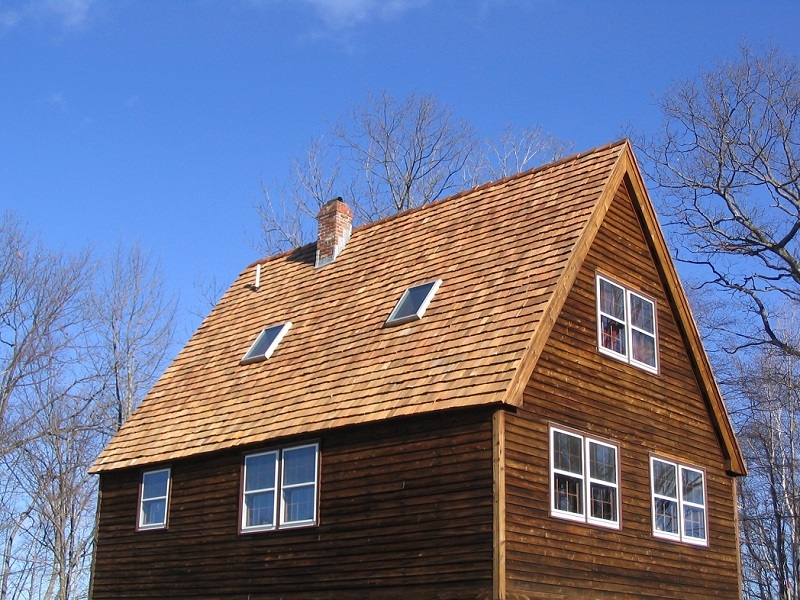 Cedar shingle or shakes are still a roofing option, but they are very expensive. Among the advantages: a cedar roof is very attractive as it ages from bright reddish brown to silvery gray; and it may provide more insulating value than asphalt. However, a cedar roof must be cleared of moss and mold on a regular basis, and since it is wood, this type of roof is susceptible to fire, even though most are treated to resist burning. Cedar shakes and shingles are typically installed on wood decking with underlayment. Unlike other materials, a row of cedar shakes or shingles is installed, and a layer of roofing felt is applied over the upper part of the row. The entire roof then becomes an interwoven system of shakes or shingles and roofing felt. This ensures water resistance, as wood is not an inherently water-proof material. Shakes may also be installed in the same manner as slate tiles, with a joist and batten system. There are now a number of products on the market that incorporate solar collection into the actual roofing material, a considerably different system than traditional stand-alone collection panels attached over the top of existing roofing materials. While most of these systems are still readily distinguished from traditional roofs, some products are now available that make solar-tiled roofs nearly identical to traditional roofs. Availablity of solar roofs are limited, though, and they require extensive wiring during installation.